In early 1913, a few Catholics moved into the growing community of Hawthorne. By 1915, there were eleven families living in and around the area. Since there was no church where they could attend Mass, the families had to travel to St. John's in Hyde Park or St. James in Redondo Beach. This created a hardship for many of them, and they decided that arrangements had to be made for a more convenient place of worship. After receiving permission from the Chancery, plans were made for Mass to be said in a small local market on the town's main street -Hawthorne Blvd. Fr. Jeremiah Burke, Pastor of St. John's in Hyde Park, said the first Mass on Christmas Day 1915. After that, he said Mass every Sunday at 8:00 am or 10:00 am on alternating Sundays. By 1916, the families believed they could support the upkeep of a church and property on Hawthorne Blvd., near Raymond Avenue (now 120th St.). Mr. Tintle was hired as the carpenter in charge of building the church. His wages were two dollars and 50 cents a day. Other men volunteered, donating and contributing their time and talents. The completed church measured 60 feet by 30 feet. 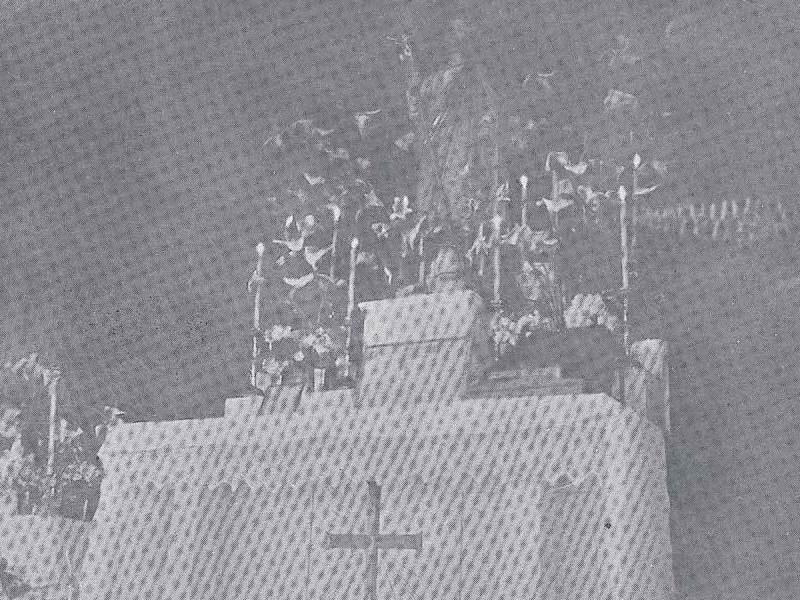 The Altar for the new Church had be discarded by St. John's in Hyde Park when a new one was purchased. Mr. Merton, the original donor of the old altar at St. John's, regained and restored it for St. Joseph's new church. Mrs. Joseph Tintle, who had a strong devotion to St. Joseph, asked that the new parish church be named in this Saint's honor. At this time, Fr. Leo Garsse came to St. Joseph to say mass. Card parties and dinners were held to raise the funds needed to complete the interior of the church. At the time, the church building served a dual purpose -a parish hall and a house of worship. 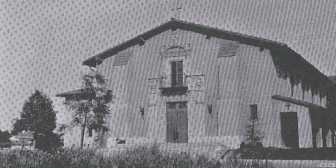 By 1920, St. Joseph was designated a parish and Fr. Paul de Munck was assigned as the first Pastor. Until a rectory could be built, Fr. de Munck resided at St. John's in Hyde Park. During this period, all went well and the parish prospered. In 1924, Fr. John M. Ford from Chicago, Illinois, was assigned as a second Pastor of the parish, which at the time numbered 100 families. A meeting of the parishioners was called to discuss the possibility of building a new parish plant which would include a school. He was concerned that children wanting to attend a Catholic School had to travel to St. James in Redondo Beach. The meeting ended with all in agreement and shortly thereafter property was purchased on Acacia Street and the corner of what is now 119th Street. community rails by Mrs. Agnes West, pews by Mr. and Mrs. Hollande, the Stations of the Cross by Mr. and Mrs. Merton and the statue of the Little Flower by Mrs. Kotel. The new church, with a seating capacity of 500, opened in August 1938 with three Masses: 6:30 am, 9:00 am, and a High Mass at 10:30 am. Fr. Eugene Mac Sweeney became the first assistant. With the opening of the new church, the first one was moved adjacent to the school and was remodeled to serve as a convent. Fr. Ford, who had been taught by the Sisters of Providence of St. Mary of the Woods, Indiana, asked the Order to staff the new school at St. Joseph. The school opened in September 1928 with 93 students and a teaching staff of 5 nuns. At this time, Hawthorne and its residents were enjoying a period of high prosperity. The Great Depression of 1929 caused the banks to close and employment and income seemed to come to a halt. Payments on the church property were made on the interest only with nothing applied to the principal amount. In 1933, Rev. Basil Killorun, C.P. was appointed Administrator during Father Ford's illness. Fr. Ford passed away in 1934 and Fr. Thomas Dowling became the third Pastor. Few changes took place during his stay, both in the parish and in the economy. Fr. Louis A. Mulvihill was appointed as the fourth Pastor in 1938. He was considered a financial genius and was sent to Hawthorne to help the troubled parish with its financial problems. Changes were made in the church and school, and a building fund was started for a new church because the parish was outgrowing the present one. Before these plans could fully materialize, Fr. Mulvihill passed away in November, 1955. Fr. Emmett Carthy, Assistant Pastor, was named Administrator. In December 1955, Fr. Patrick J. Redahan became the fifth Pastor. He continued with the building fund and the improvements to the existing church and made additions to the school. It was under his direction that construction of the third church began. 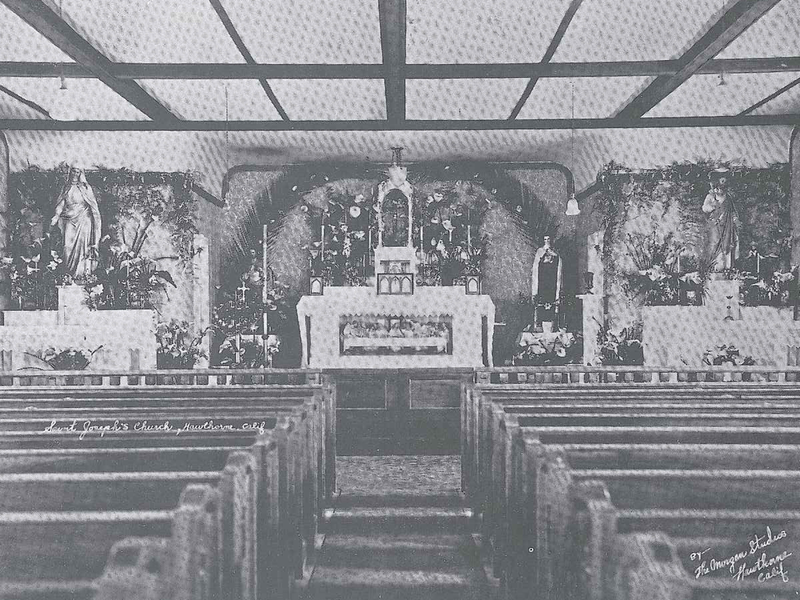 Although the interior was not yet finished, Mass was first celebrated in the new church on Christmas day 1957. The church was dedicated by Cardinal McIntyre on February 15, 1958.
spent with us. Additional Eucharistic Ministers, Ministers to the Sick, Lectors, and Greeters were commissioned to assist the priests in the administration of one of the largest parishes in the Archdiocese. Two Sisters of Providence served as Parish Sisters, assisting the Pastor in various Ministries. The Rectory and Hall Kitchen were remodeled to accommodate the growing needs of this large parish. Early in 1987, Fr. Hagenbach became seriously ill. In August of that year, Fr. Edward Berumen, Associate Pastor, became parish Administrator. Fr. Hagenbach passed away on December 7th, 1987. On March 19, 1988, Fr. Eugene Buhr and Fr. Joseph Moniz, became the first Team Ministers (Co-Pastors) of St. Joseph Church. In September, 1990, the parish continued to prosper and grow. As in the past, many dedicated and faithful parishioners continued to work closely with the priests and nuns in their service and love for St. Joseph's Church.